I wanted to write a quick post here to update where The Long Eighteenth is, so far. If people would like, I’ll make this a regular (maybe bi-weekly?) feature. So far, we have sixteen contributors with access to the front page. Many of you have yet to introduce yourselves, so please remember that it’s not too late. This was formed as an international and interdisciplinary site, so your perspectives on eighteenth-century scholarship and pedagogy will be greatly welcomed. We also have an active and responsive commentariat. Allen Michie has proposed that we find a way to get larger space for comments, but Haloscan keeps a strict 10,000-character limit on comment length, unless we are willing to spring for Haloscan Premium. I imagined, in my paranoid brain, that it was expensive, but now I find it’s a one-time fee of $12. I will be happy to pay this when my checks come in, but due to endless administrative errors, I have not been paid yet this semester and have $24 to my name. The widow’s mite? I’d rather buy eggs, at the moment; then I’ll pony up for Premium. If the text of this image is illegible on your computer, click on it to view it full-size. 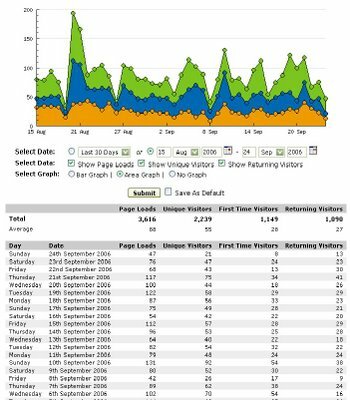 The orange part of the graph reflects the returning visitors, the blue part represents new visitors, and the green part reflects the total number of clicks, which includes people reading through older entries and refreshing their browsers. You’ll notice there is a natural ebb and flow of traffic, which roughly corresponds to the work week. (For some reason, half as many people read blogs on Fridays.) Spikes in traffic occur whenever another blog links to us or when people post to C18-L about this site. Our first blog event is coming up, of course, on October 3-5, when we’ll be discussing Michael McKeon’s The Secret History of Domesticity, in conversation with the author. Thanks to David Mazella for setting up this exciting event! I urge everyone to contact your colleagues and students to let them know about this. I sent an email to my department and found that everyone from Renaissance to Romanticism was excited to hear about it. Again, I urge, with regard to posting, that we not be shy about it. Many people seem concerned about accidentally posting at the same time as someone else. In my experience, this is not a problem at all. People tend to read through feed aggregators that list posts by title and subject, and even those who read by clicking on the page seem to have no problem finding and reading whatever is new. You will also notice that there is a new, improved “Recent Comments” section in the sidebar. Haloscan has finally put out its own ad-free widget, and I love it. I hope you do, too. Thank you, everyone, for your ongoing contribution to this project. Although I am young, I am continually impressed by how effective the internet has become at creating communities of people who want and need to speak to one another. Please spread the word, and feel free to start conversations here at will!